Good morning, readers! Are you desperately seeking inspiration for your writing during these dreary winter months (today’s sunshine aside)? We thought so. 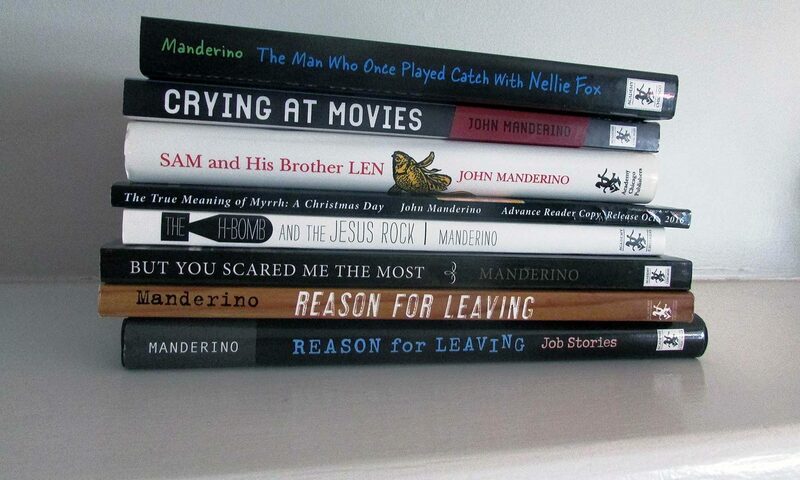 So here’s some food for thought from John Manderino, who has published multiples titles with Academy, including Reason for Leaving: Job Stories, The H-Bomb and the Jesus Rock, among others. Enjoy, and get back to your writing! When did you first become interested in writing? Has storytelling always come naturally to you? I first became interested in writing around the time I became interested in reading books and what they could do to you, a book like The Heart Is a Lonely Hunter for instance, the secret places inside of you it could reach, places you didn’t even know were there. Also, storytelling seems to run in my family. You could never, for example, ask my mother a simple question without her unrolling a narrative with the answer at The End. Tell us a little about your road to getting published and what you learned throughout the process (whether about yourself, the writing process, etc.). The first book is the hardest because you don’t have anyone out there already interested in looking at it, the way you have with subsequent books. So it’s very hard to keep plugging patiently away, to keep caring wholeheartedly about the right word in the right place. What is the most rewarding aspect of having your work published? The most rewarding thing is holding the book in your hands, walking around with it, imagining the hundreds—no, thousands—no, millions who are going to have such a splendid time reading it. How has your writing process changed with each work that you have had published? With each book I’ve published, I think—or anyway like to think—I’ve been more willing to take chances, go a little deeper in the jungle, worry less about getting lost in there. The poet Mark Strand once said in an interview something like, “If I knew where I was going, I wouldn’t go there.” I believe deeply in the importance of following your nose, of discovering where to go as you go. What is the most difficult aspect of writing professionally? You have to ignore what’s succeeding out there and stay with what matters to you, what you deep-down feel is worth exploring, however marketable it turns out to be or not. Which authors do you most enjoy and admire? Is there any one author in particular that has been inspirational or a role model for you? Hemingway was probably the most sudden and dramatic influence on me. When I was young I was trying to write in a very lyrical way, to make the reader swoon, the way James Joyce does in Portrait of the Artist as a Young Man, but I remember sitting in a coffee shop one day reading Hemingway’s story “The Undefeated,” the passage where he describes the picador working away on a bull, and I was stunned by the absolute clarity of it, in plain language that did not draw attention to itself but to the thing it’s describing, like the Japanese say about haiku poetry and why it’s so unadorned, how pointing towards the moon with a jeweled finger distracts your attention from the moon. Can you pick a favorite out of all of your novels? If so, which aspects of this novel really stand out for you? I guess my favorite is Reason for Leaving because I went after a very clean, stripped-down way of speaking and feel that I pulled it off, for the most part. The H-Bomb and the Jesus Rock” came out of a whole big bag of things from my grade school years—the fear of sudden nuclear annihilation, the equation of the Red Scare with the Red Devil, coldblooded nuns, a fat kid in the neighborhood with a vast collection of baseball cards and a perfect capitalist mentality, this letter the pope was supposed to open which the saintly little shepherd children of Fatima got from Mary, which would predict the fate of the world, and this complete belief we had in signs, in holy objects, for instance a rock that looked like Jesus, and the power of such a God-placed thing, and of course looking for empty pop bottles to get the two-cent refund—all of this was mixed together, so writing the book became a matter of separating all this stuff into elements that could carry a story along. I had a lot of trouble coming up with a title. I usually have one pretty early on, but I didn’t know what to call this one. I finally just jammed the two major elements of the story together. I’ve just recently finished a novel called Bopper’s Progress, about a young man who decides for various reasons—all of them wrong—to become a saint. I’m very excited about this one, I like it more than anything I’ve done, and hope something happens with it. Meanwhile I’m working on a collection of stories each of which has some sort of monster at the heart of it, literal or otherwise—I’m having trouble with a title. What is the best piece of advice that you’ve ever received about writing? I remember the novelist Ted Weesner saying something I’ve always kept in mind. He said whenever he got stuck at a place in a story and didn’t know how to continue moving forward, instead of trying to figure out some clever maneuver to pull him out of the ditch he would get up from his desk and walk around asking himself, “What is true here? What is true?” By that of course he didn’t mean factually but what is true psychologically or emotionally or what-have-you, and the answer to that question would tell him what to do next. Often it meant backing up, sometimes all the way to the beginning, which of course hurts but you have to be willing to do that. Q: Where did you come up with the idea to write your book? As kids, my brother and I always had a sincere regard for the Baby in a manger, the Wise Men and the shepherds, all that. And both of us got genuine goose bumps at Midnight Mass when the choir sang “The Little Drummer Boy.” But that was all just a pleasant prelude to the real joy of Christmas next morning, the joy of getting stuff. But it had to be the correct stuff.And if, for example, you opened the one box you were absolutely sure contained the hockey gloves you’d been hinting at since before Thanksgiving, and they turned out to be house slippers, then all the little drummer boys in the world could not console you. And yet sometimes, often in peculiar ways, there were these sudden openings during the day, into something deeper, something actually in line with the Baby in a manger, the Wise Men and the shepherds, all that. A novel is always difficult because no matter how wonderfully high-flown your over-arching idea might be, you still have to somehow manage to move people from one room to another, give them things to say and do, things to wear. This book came somewhat easier as it was developed out of a chapter from my first book. Q: Do you have any tips you could pass on which would make the journey easier for others? Don’t wait to be inspired. Set aside a block of time every day, even just an hour, and treat it as a job at which you’re punching in and punching out. I usually manage three hours, and if all I do is sit there pounding my forehead on the desk, that’s all right, I’ve put in my time. Q: Who is your publisher and how did you find them? This publisher is Ice Cube Press, out in Iowa. Steve Semken runs it. He phoned one evening and told me about reading parts of the book aloud to his wife, which was quite a nice thing to hear. Q: Anything that surprised you about getting your first book published? That was back in ’94, a book titled Sam and His Brother Len. I was so thrilled when Anita Miller at Academy Chicago Publishers phoned me one rainy afternoon. The book wouldn’t be coming out for over a year, however, and that turned out to be unfortunate because, instead of moving on to something new, I did a lot of tampering with it, making substantial changes which, I’m convinced, did the book real harm. It still pains me to think about it. Anyway, I’m much better now at leaving something alone once I finally like it. I’m in the middle of one more draft to a novel titled Bopper’s Progress, which takes place in a single rigorous day at a Zen Buddhist monastery—which sounds a lot more solemn than it turns out to be. I don’t know if this one will ever make it into print but I’ve enjoyed writing it quite a bit. Q: What is one fact about your book that would surprise people? The illustrations for the Christmas book are by my sister Nancy, who’s one of the few remaining shy, modest people left on the planet. No one besides her students and family knows how talented she is. Now, hopefully, lots of others will see. Q: What message if any are you trying to get across with your book? I’m not sure I agree that fiction ought to provide some sort of message, that it should “mean” something, any more than a tree or a shoe does. I just hope that, regardless how hooked on gizmos we become, there will still be plenty of people who enjoy reading books. It’s depressing to think otherwise.